The Bahamas, located in the Caribbean, is a country consisting of many islands both large and small. All are flat and most have wonderful beaches gently lapped by brilliantly blue, warm waves. Each offer their own particular charm. Some are lively, others provide a perfect hideaway for those seeking total relaxation. With a whole raft of water based sports and activities such as swimming with dolphins and underwater cave exploration; golfing and fishing, island hopping tours and visiting historical sites, the more active visitor can be fully occupied. New Providence is the main tourist island,with Grand Bahama following close behind with its pristine beaches and the Lucayan National Park, where you'll find the world's longest underwater cave system with over six miles of tunnels and caves. If fishing is your passion, head for Bimini which lies very close to the Florida coast, and if you can afford to rub shoulders with the rich and famous, take yourself to Eleuthera. Standards of accommodation are high in the Bahamas. All-inclusive hotels offer particularly good value, especially for families with offspring with insatiable appetites. Restaurants serve a wide variety of international food but don't miss out on local dishes which are a little spicy and certainly delicious. Evening entertainment is accompanied by the beat of Caribbean music which people find impossible to resist, and most find themselves dancing beneath the stars enjoying the gentle breeze that cools the brow. Those who enjoy a holiday flutter can visit the luxurious casinos and try their hand with Lady Luck. 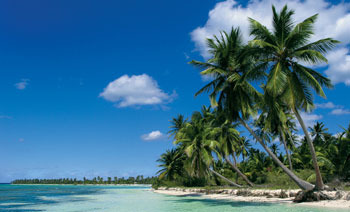 As a subtropical island, the temperature in The Bahamas varies little. There is however heavy rainfall from June to October. Unless you are happy with high humidity, book your trip between October and May. You will then also avoid the hurricane season. If you find the allure of a cheap Bahamas holiday irresistible and you wish to avoid the tiresome task of trawling through web page after web page trying to find the best deal, try our simple search facility. You'll find over three dozen travel companies competing for your custom. It is simple to use and remember, competition brings out the best bargains. Our search facility enables you to see, at a glance, the Bahamas holiday that is the cheapest and the one that offers the best value for money. All you have to do to secure the holiday is make a phone call. To book the best deal, and to avoid disappointment, ring today.